Note: since writing this post I have come up with a new sprint retrospective technique called Quartering. Note 2: you can find even more simple and effective sprint retrospective techniques in my follow up posts Sprint Retrospective Techniques 2 & Sprint Retropective Techniques 3. When interviewing prospective Scrum Masters there are a number of questions I ask them about their retrospectives. First of all I ask if they hold retrospectives with their team after each sprint. I then ask how they run their retrospectives. Finally I ask if they vary how they run their retrospectives. The answers to these questions are one gauge I use to measure the the candidate Scrum Master’s level of experience. 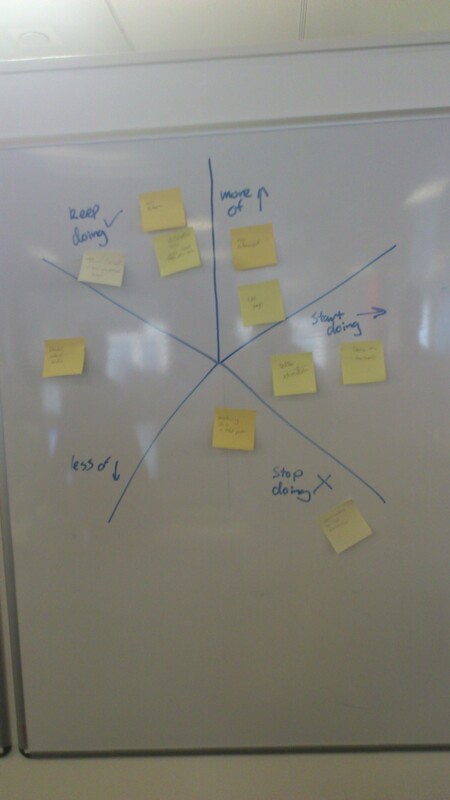 I focus so much on retrospectives because how they are run is crucial if a Scrum team is to function efficiently. Holding retrospectives is vital to Scrum teams who are looking to continuously improve (and a Scrum team that is not looking to continuously improve isn’t worthy of being called a Scrum team). Holding retrospectives after every sprint is a must if a team is to maintain its pace of improvement. Having a technique for running retrospectives is important for imposing a structure on the team’s discussion. However, having many varied techniques is essential to keep the exercise interesting for the team and to prevent great ideas for improvements from drying up. Retrospectives that become staid are little better than not holding them at all. I have encountered several retrospective techniques over my time as a Scrum Master. Here are three simple techniques which I find work well. (each technique requires the following resources: whiteboard, white board markers and stickies/post-it notes). What Are the Techniques Good For? So that describes the process for each of the techniques. You probably noticed that the techniques are broadly similar. 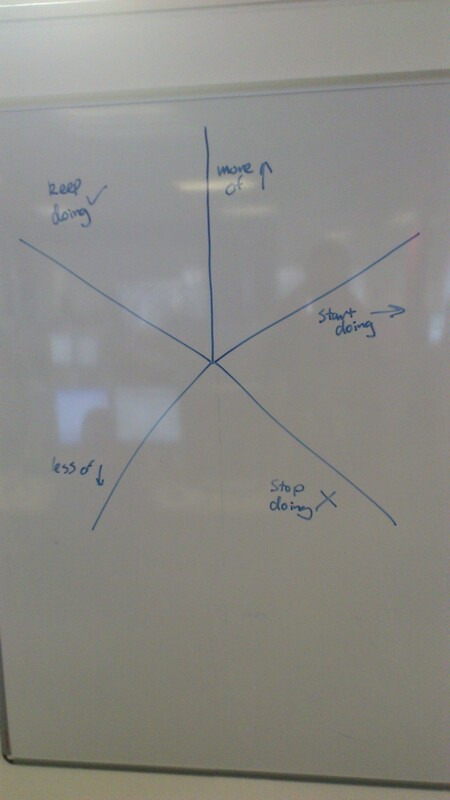 Each divides the whiteboard into areas for different categories of ideas. The team is then invited to place their ideas into each category. The team then groups similar ideas together. Finally the team goes through each grouping identifying corrective actions. So why do I use these particular techniques? What is good about them? There are a few reasons. I like all of these techniques because they are simple. They can be explained to a team very quickly. They require only basic materials. They can proceed from start to finish in well under an hour and you still end up with a good set of corrective actions. All of the techniques encourage the entire team to participate. 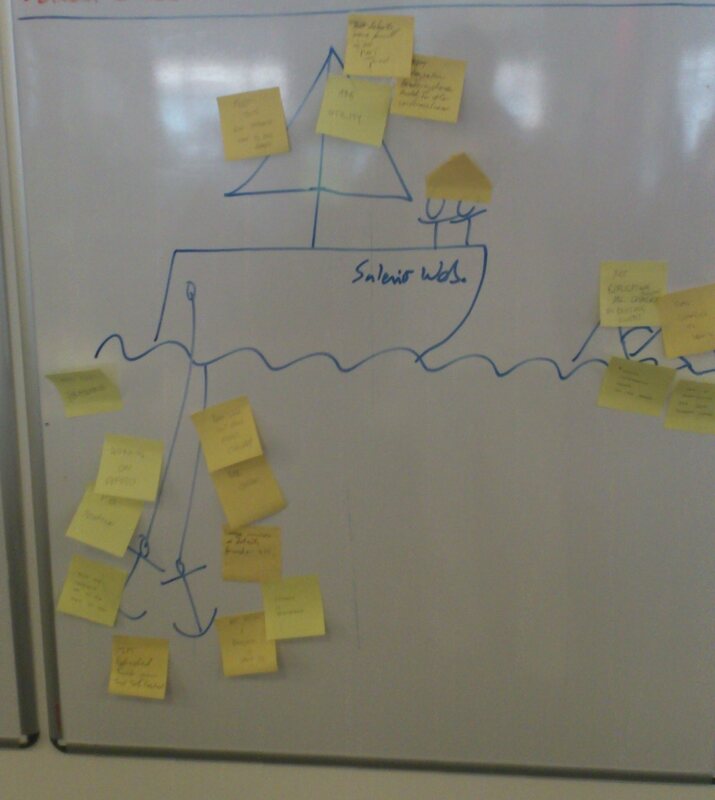 Each team member can place their own ideas on the board with equal weight. If instead ideas came forth via a discussion more vocal team members could take over while shyer team members would withdraw. Where there is no initial discussion this cannot happen and the team benefits from everyone’s input. The grouping exercise is also key because the team members do it not the Scrum Master. They are again participating directly and putting their own stamp on the exercise by deciding which ideas are related. 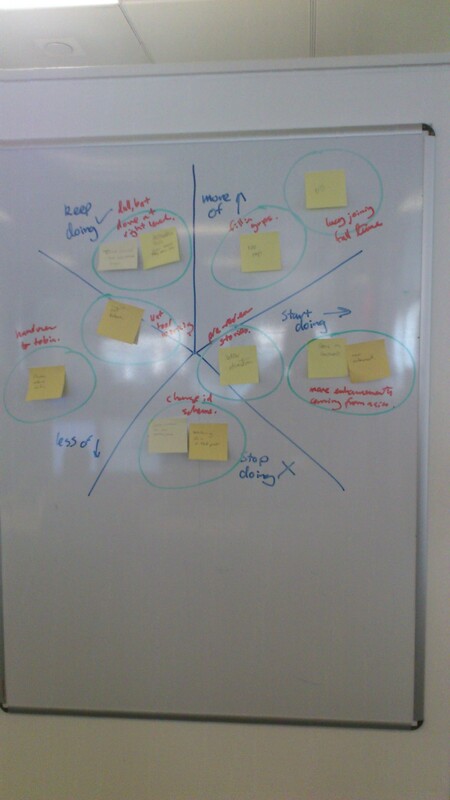 Also with the grouping in place corrective actions become easier to identify and prioritise. If, for example, there are double the number of stickies for one grouping as opposed to another then it is obvious to all that the first grouping probably represents the more pressing issue. As the team is so involved in the retrospective from start to finish they get a justified feeling of ownership over the process and any corrective actions that are identified. With these techniques the Scrum Master’s job is also easier. They have a structure for their retrospectives and do not have to do all of the work in the session. The Scrum Master simply keeps the process moving perhaps using improvisations. For example, when picking the next grouping to discuss they may ask the team to dot vote for the most important groupings or ask a team member to pick what is most important to them. Such minor changes are important to keep even varying retrospective techniques fresh. Those are the similarities. It is important to note that there are also differences between the techniques. The differing categories between each technique are key. They lead to different types of ideas being raised as they each make teams think in a different way. The Sail Boat, for example, is very simple. What is helping us? What isn’t helping us? However, you can elaborate on the process. I like to add rocks to represent risks that could ‘sink the project’. You could also add a sun to represent ideas for the team’s hopes. The Wheel takes the core idea of the sail boat’s sails and anchors further. It not only asks what is making the team faster or slower but also goes into more granular detail about what the team should start/stop, do more of/less of or simply continue doing as before. My personal favourite is Mad Sad Glad. The categories do not focus on the back and white of team productivity but instead look at the types of emotions the team experienced over the sprint. This can elicit some very interesting ideas. I especially like the distinction between Mad and Sad. Both are obviously negative but each can attract quite different issues from a team. The Mad Sad Glad technique can also be extended. 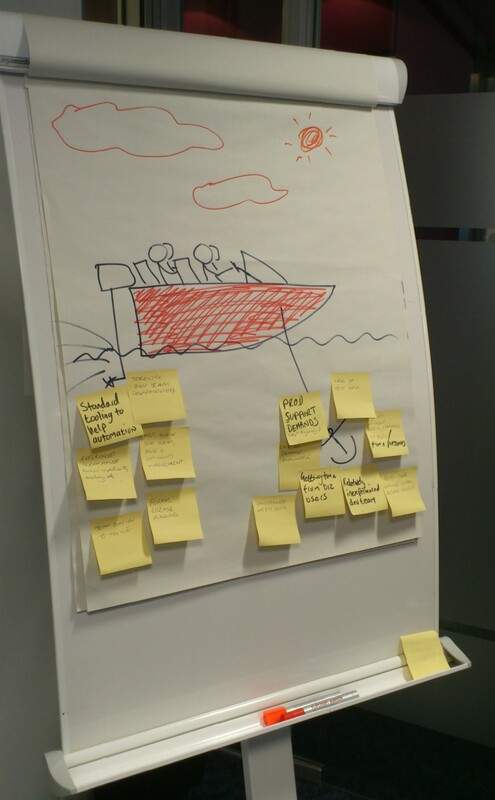 For example, I sometimes add a fourth category labelled ‘Scared‘ where the team can post the things that they fear. For instance, the team may fear that they will not make a crucial delivery. So on the face of it the techniques are similar. However, they elicit different types of feedback and different corrective actions. They also inject a bit if fun into retrospectives. Finally with the application of many techniques retrospectives do not become boring affairs and the team’s ideas for improvements do not dry up. So now that the team is armed with corrective actions what do they do with them? I will cover this topic in a future post. This entry was posted on April 1, 2012 at 9:00 pm and is filed under Agile, Scrum. You can subscribe via RSS 2.0 feed to this post's comments. Nice post. The “Sail Boat” technique listed is a known variation of the Innovation Game® Speed Boat. You can find online versions of this game that you can play with distributed teams at http://www.innovationgames.com/speed-boat. Will surely implement the Mad/ Sad/ Glad idea.. Simple and ofcourse captures the emotion of people for the sprint. I just used Mad/Sad/Glad yesterday. Response was better than expected. Although given that this was the first time we were doing it we did a small change and due to not having proper materials, instead of using sticky notes the Scrum Master was taking the notes in a whiteboard still I think for the next one we’ll try the sticky notes and see which one works best. I concur Cruz. 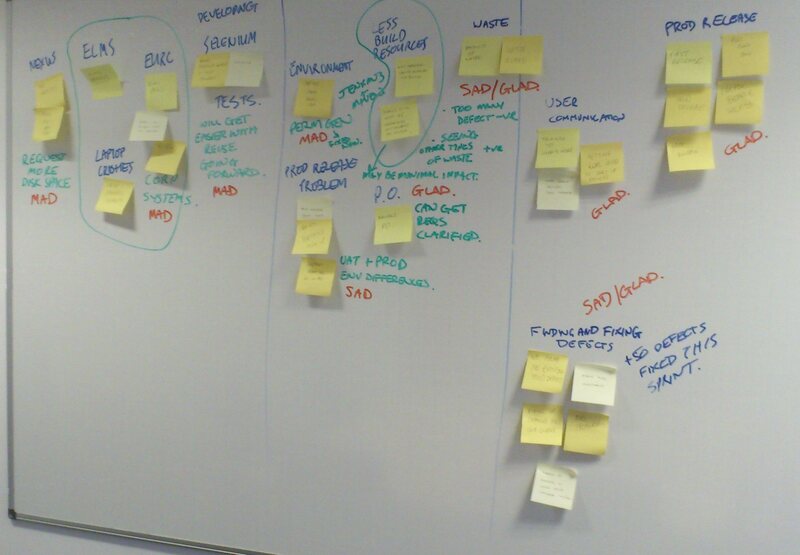 You want no barrier between the team and their putting their thoughts on the board – not even the Scrum Master. I specifically liked the START, STOP, CONTINUE. I also wanted ‘Do More of’ and ‘Do less of’ included as well in my framework. But When I thought about it I was not completely convinced that Do More of and Do less of are completely different from CONTINUE to stand on their own as different categories, instead they are part of CONTINUE. Do Less of: Team has seen some value, but not as much. at the same time they do not want to STOP doing the task or following the process. however, they want to do less of it. Hence, I followed the following framework and it yielded good results by encouraging the discussion.